I’ve been having fun recently making silicone moulds of various knick-knacks I have lying about and then using those to cast resin pieces. Here are a few…. I gave these as Christmas presents to friends. Don’t worry, I’m not spoiling the surprise, they couldn’t wait until Christmas day and have already opened them! 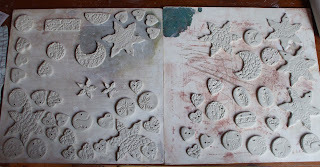 I mentioned a while ago that I was making porcelain Christmas decorations and here they are finished…. OK, these may not be traditionally Christmassy but it was important to me that they fit in with the rest of the things that I make. I hope people like them because I've made quite a few! As you can see we also made matching scarves - I'm very pleased with the result. Also, Angela sent us away with our own custom-made glove template so now I can make felt gloves to match every outfit!!! Have a look at Angela's blog to see what everyone else made at the workshop - and you can also see the other workshops Angela has planned for next year - highly recommended! P.S. I know I haven't shown you much of my silver jewellery recently, but I'm currently working on Christmas presents for people who I know look at this blog. I just wanted to keep them in suspense until Christmas day!! Promise I'll show you what I've been up to in the New Year. Here are some more of my resin experiments. If you remember from last time I was looking for a better way of concealing the bail so I thought I'd try using some haematite beads as frames for the resin. I'm much happier with the look of these bails. I did get some pesky air bubbles creep in the resin though - I've got to work on that. I love the crystal-clear quality of these pieces but I'm going to have to find a better way of concealing the bail - more experiments required! I'm still happily experimenting - my mind is buzzing with ideas - will let you know how I get on! I recently went for afternoon tea at the Midland Hotel in Morecambe – for my good friend Julie’s leaving do from work. The Midland is a newly renovated Art Deco hotel and you have tea in the Sun Terrace – where you get great views over Morecambe Bay. I’m afraid I stuffed myself silly with the delicious cakes and scones! During my visit, I got rather inspired by the strong lines and geometry from the Art Deco period and this ring is the result. 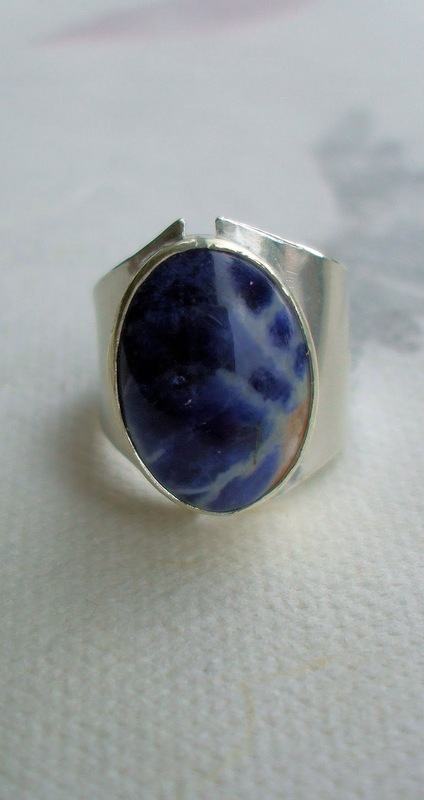 I’ve had this sodalite stone in my stash for a while now. The pattern is lovely on it so I grabbed it as soon as I saw it. Still trying some more designs…. I’m still on my quest for more variety of designs for my porcelain disks. 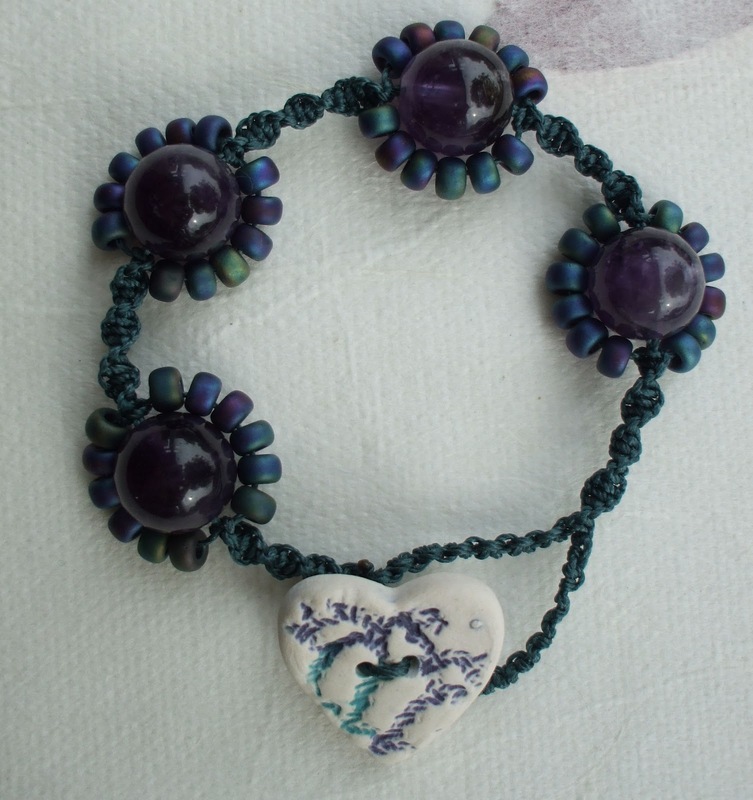 Here is a necklace – a tumble of glass beads and organza…..
....and this is a macramé bracelet, I’ve used amethyst and seed beads in a flower design with my favourite twisting knot…. Well, I’d love to tell you how I carefully thought about and planned this design but that would be a big, fat lie - it just kind of evolved! I was reticulated a piece of silver and for some reason this large air bubble appeared. 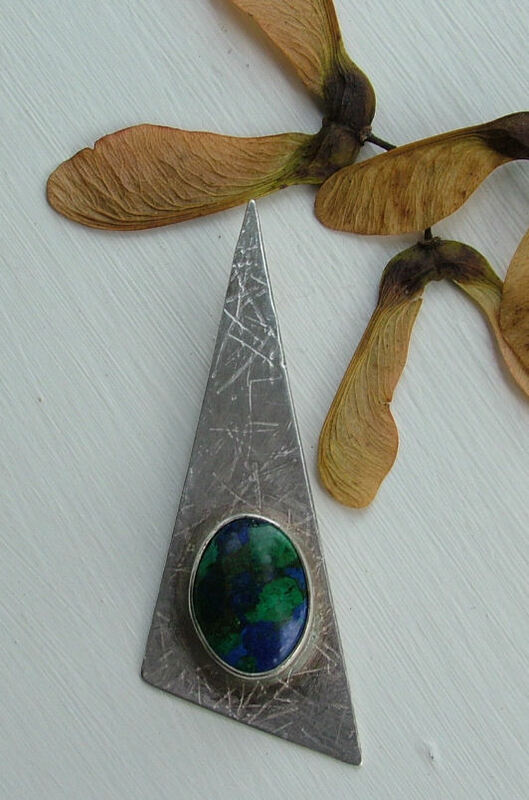 After scratching my head for a while, I realised that it kind of matched the shape of this dichroic glass cabochon that I made in a workshop (at the same time as this one) with Jo at the Silver Forge. So I domed the reticulated silver and soldered on the setting for the cabochon. Since I was in an experimental mood I tried a different bail too. My friend said ‘oh, this is one of your abstract pieces’ which I think is her polite way of saying she doesn’t much like it. 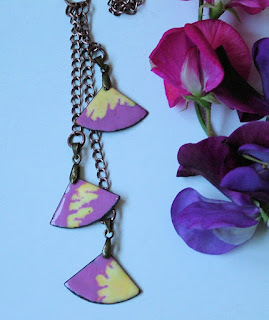 But the shape appeals to me – what do you think? 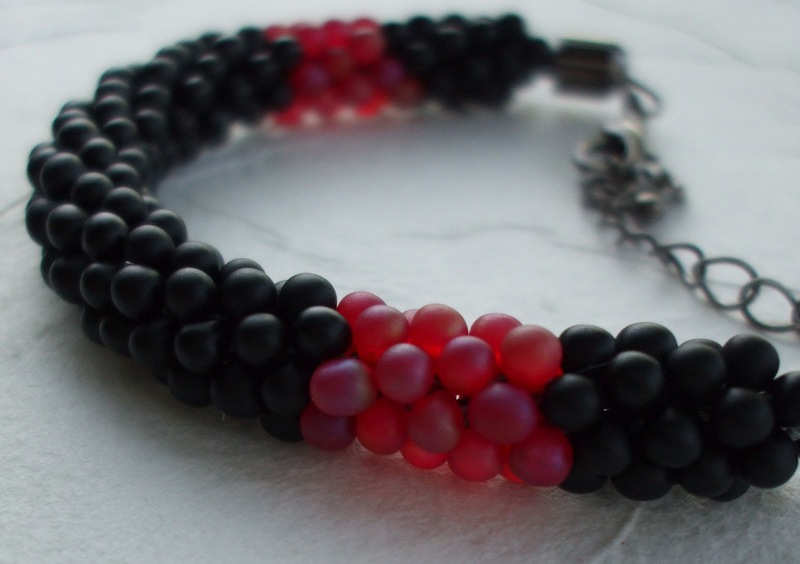 I bought these lampwork beads at a craft fair. The maker (sorry, she doesn’t have a website so I can’t give you a link) was selling some of her beautiful beads made up into jewellery but also strands of loose beads. Naturally I gravitated to the loose beads. 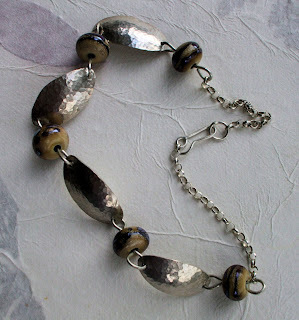 I made sterling silver links and combined them, with the beads, into a necklace and bracelet. My cat, Tigger, was ‘helping’ during this photo shoot. 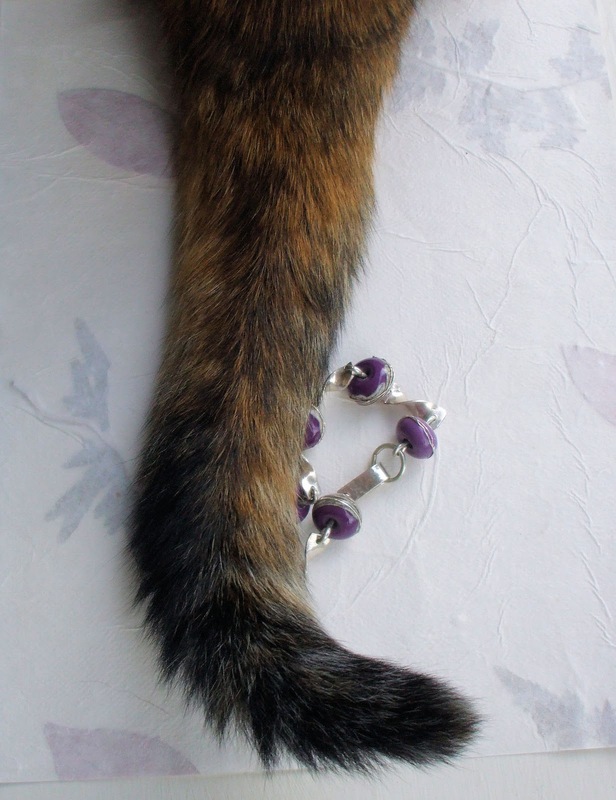 I had to grab the shot of the bracelet in between tail swishes! I spent a happy afternoon yesterday making more porcelain pendants. I was trying a few new shapes this time and some new textures (buttons and lace) that I’ve found. I was even – and I apologise for saying this – making Christmas decorations. 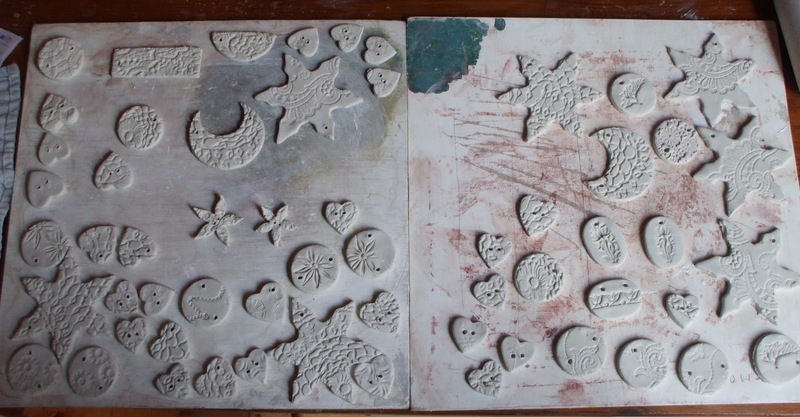 It seems bonkers to be thinking about Christmas now but there are quite a few steps these need to go through before they are finished (they need to be fired twice and glazed) so I thought I ought to get these started. I was on holiday in the spring in the Canaries. It was wonderful to be in the sun after the gloom of a Lancashire winter. One of the best things - apart from being with family - was that I could swim in the sea. I haven’t done that in ages. I find it strangely calming to bob up and down with the waves – letting yourself go where they choose to take you for a time. To remind me of this, I made this ring – and a promise to myself that I’d swim in the sea more often. I like that the disk is so lightweight and portable. I’ll keep it in my bag so if I ever find myself sitting somewhere (on a train, at the hairdressers….) I’ve got something to keep me occupied. Most of the things that I do require tools and space (I’d look a bit deranged in the hairdressers with a hammer or torch!!) so it is good to find something that I can take out and about with me. I’m trying out some new designs for the porcelain disks – I wanted a bit more variety. 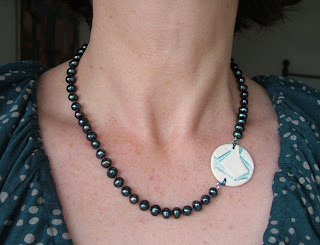 First up I knotted some freshwater pearls onto silk and threw in one of the disks. I wanted this to look asymmetric. 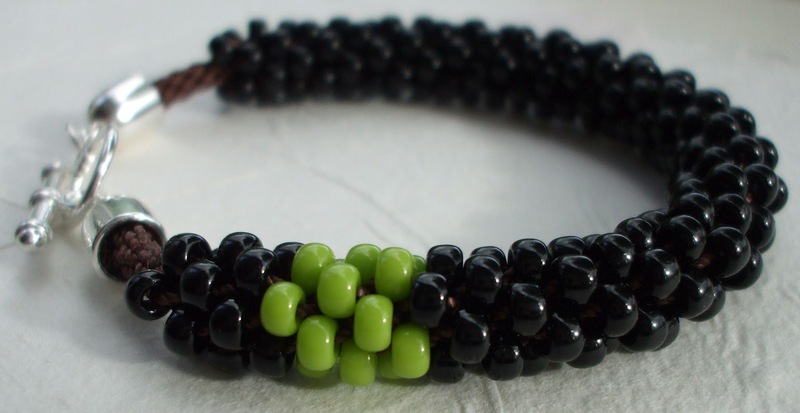 Next, is a bracelet made with seed beads and copper. I love this colour combination. 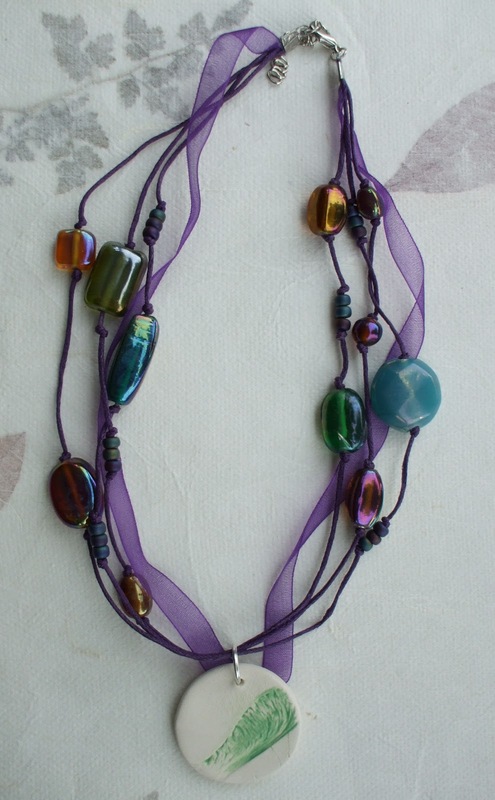 I got this design from a tutorial on the Gossiping Goddess blog – thanks Lesley! I modified it slightly by adding a macramé clasp – but it is a great tutorial, really easy to follow. 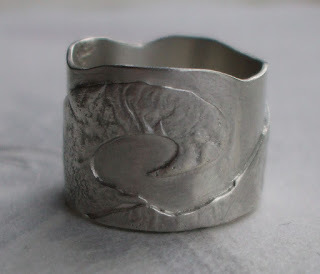 This weekend, I was looking back at some of the things I made when I was first starting to work with silver. It is always interesting to look back sometimes – reflecting on the things that seemed so challenging at the time and which are now second nature. 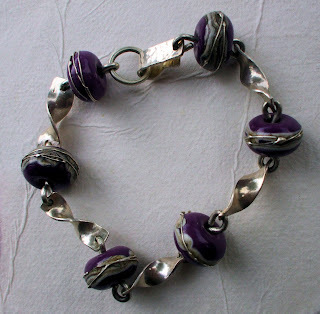 This is the first thing I ever made in silver. Actually, I had a broken finger when I made this ring. I’d signed up for the class and was excited about it so I still went along even though my arm was in a sling! Not ideal circumstances to learn silversmithing but I thought I could at least watch what was happening in the class. But to her credit Adele, my teacher, took it all in her stride and said she thought I could still make something. 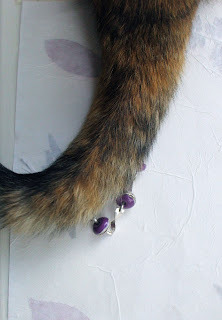 She had me make this ring – helping out when two hands were required! This is the first stone that I set. 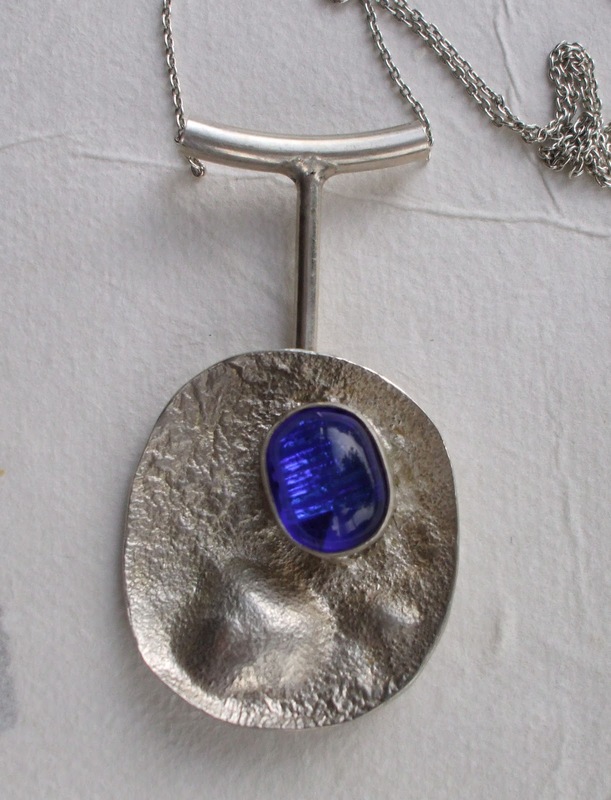 I still wear this pendant because I like the shape of it and the stone (Azurite) is lovely. Now that they’ve been fired, the colour combination that I chose reminds me of those Rhubarb and Custard sweets that I used to like as a kid! 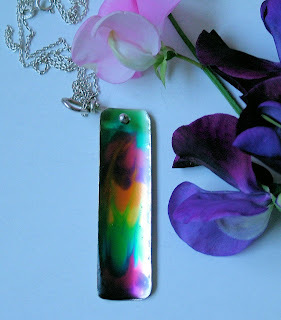 I’ve also been experimenting with using resin as cold enamel on silver. All in all, I think cold enamelling suits me better. I did enjoy the workshop at the weekend but a lot of the time was spent in preparation – there is a lot of time needed to clean the enamel powder and the metal – I guess I’m more of an instant gratification kind of girl! Plus, I don’t have to wear a dust mask with cold enamel – I always feel a bit claustrophobic in those things! 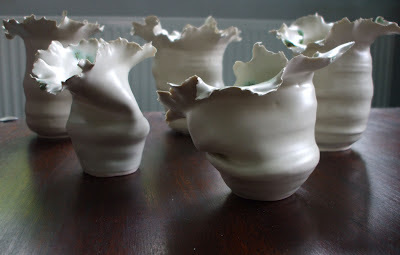 After years of trying to throw the perfect pot, I’ve had a change of heart and have recently been throwing wonky pots – knocking them off centre and adding folds and creases into the clay. The challenge being even though they are wonky, they still need to look beautiful. They have a more organic nature than the ‘perfect’ pots and the glaze does interesting things – pooling in the undulations of the pot. I’ve added my fluted rims and I’m absurdly pleased with the result. 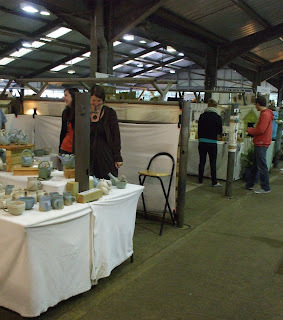 I blogged last week about Potfest in the Park and this weekend I went to Potfest in the Pens. Again this was a great day out. It has a different feel (and smell!) to the previous weekend. It is held in an Animal Auction Mart – each of the exhibitors has one of the animal pens to display their work. 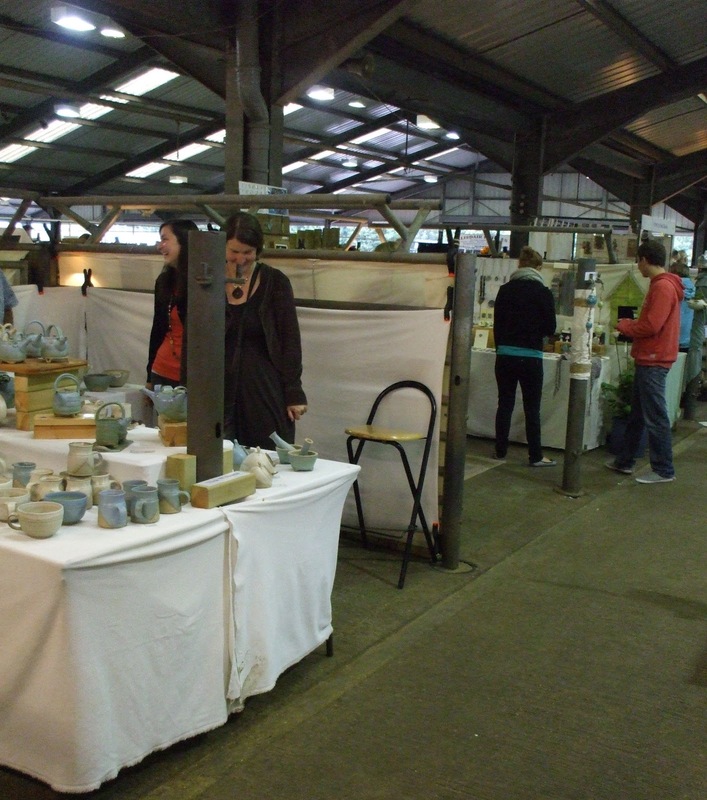 It is the only unselected show in the UK so you can see people just starting out alongside more established potters. As with last weekend, they were all incredibly generous with their time. I invested in some velvet underglazes. I use underglazes to colour the porcelain disks and I’m excited to try the velvet version – they should give some sheen to the disks. I also bought a tile cutter with interchangeable shapes for cutting clay. Expect some larger pendants soon! Well done to the organisers, Geoff and Christine Cox, for organising two such inspiring events – particularly over adjacent weekends! 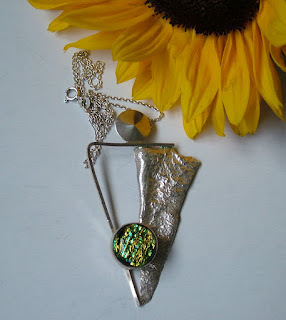 I must have been in a geometrical state of mind when I made this pendant. I started with reticulating the silver triangle and then added the silver wire to echo the shape of the triangle. I made the dichroic glass cabochon last summer in a workshop and it seemed to work on this pendant. Finally, I finished the pendant off with a domed circle at the top to hide the bail. I’ve been using reticulation – melting the surface of the silver enough so that it starts to ripple like water but not so much that it melts completely - a lot at the moment. 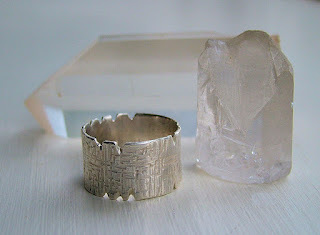 I like to include texture in my work and this is a great way to do that in silver.